The Bull Ring in the city centre is the centuries-old area where market traders used to come and sell their fare. 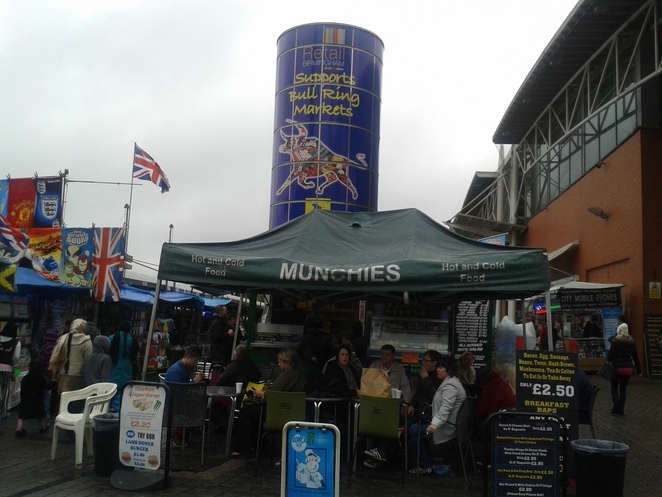 When Bull Ring re-opened as a retail hot spot, ten years ago, the market was given a new lease of life and Bull Ring markets were reborn. Today it is a lively spot in the city, which contends with the Spitalfields markets in London. 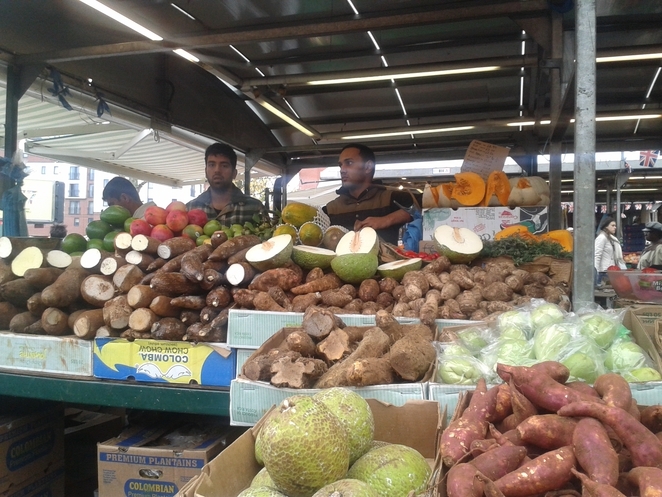 Greengrocers are loud and proud. Each market trader vies for your affection by shouting 'a pound a bowl', referring to bowls filled with at least eight pieces of a particular fruit/vegetable. You can't help but giggle, and admire their confidence, it's a shameless shout that their stall is better than their neighbours. Organic, local, British, as well as international is available at the market; you'll find produce from Asia as well as the West Indies. A friend of mine owns one of the stalls, and to my amazement he could tell the difference between a Jamaican avocado, and one from the Dominican Republic. 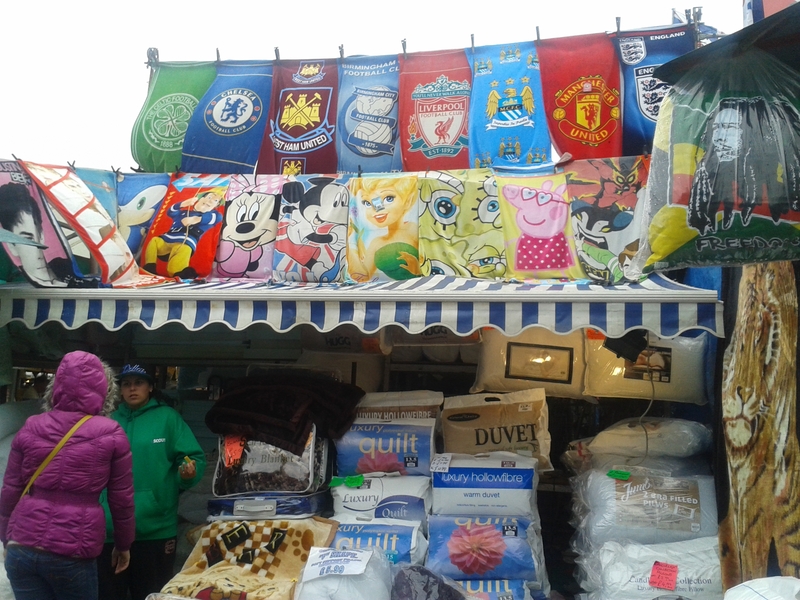 I love the market because it's the only place in the city centre which truly caters for the diverse palette of Birmingham's residents. 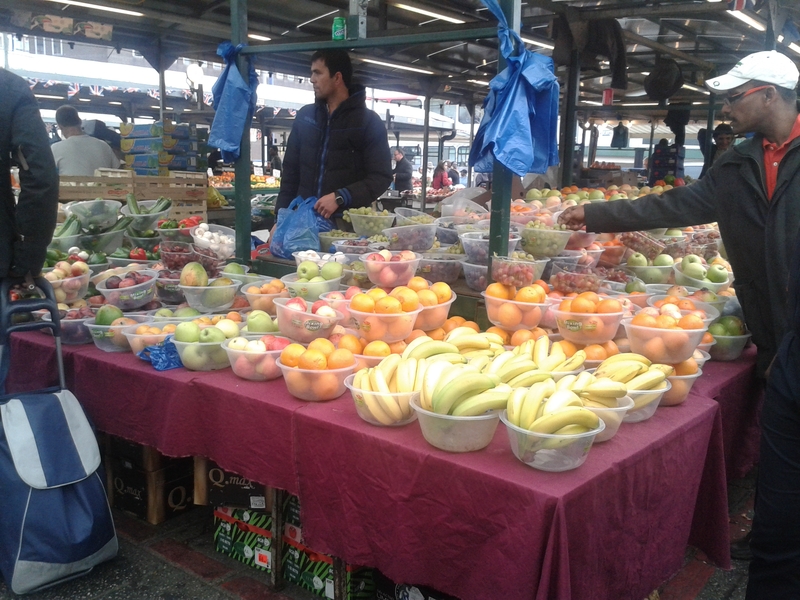 My grandmother has been visiting the Bull Ring markets for the past thirty years and insists it's the best place for fresh fish, fruit and vegetables - and she's not wrong. The saying goes 'mum knows best', but grandmas are wiley ones too. Quite simply the market is a dirt-cheap place to buy some of the best store cupboard and vegetable drawer eats. Shop around though because from a distance the produce looks the same, on closer inspection however, you'll see bright and firm skin, or slightly wilted and marked flesh. Choose wisely because even though it's cheap, you want the food to last before you make another trip to this rowdy place. For a bunch of eight bananas I paid 80p, five bunches of adult spinach £1.00, five peppers £1.00, 3 British large cucumbers £1.00, and two punnets of fresh strawberries for £1.50. A lovely man also gave me nine figs for free, I couldn't believe it. The food will last me a week, and it's the first time I've spent under £10 for a week's worth of my 'five a day'. Baked goods like cupcakes, biscuits, flapjacks, as well as branded cartoned drinks like Ribena, Lucozade, and cans of Red Bull. Eggs in cartons of 12 are sold at £1.50, which is ideal if you have a large family. 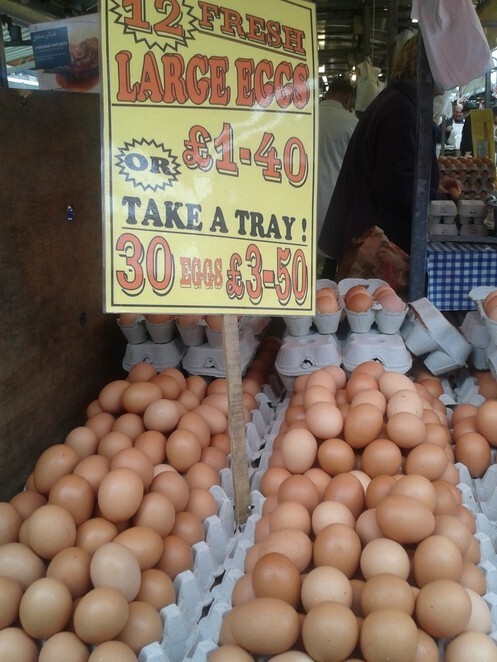 A dozen eggs would feed me for two weeks, but Monday to Friday the market traders told me they can sell up to 50 boxes a day, especially if you're an active baker/body builder. There's everything for the home at the market as well; toilet rolls, carpets, underwear and mobile phone cases are in the stalls adjacent to the food side of the market. Have your wits about you because while the market is a very safe environment, the stall holders can recognise a new face immediately, and you don't want to get ripped off. Haggling, however is part of the fun, and don't worry if you're a couple of pence short of the amount - they understand, and a few pennies won't harm their business. The traders encounter all walks of life, but mostly everyone is looking for value for money, and the market has that in abundance. 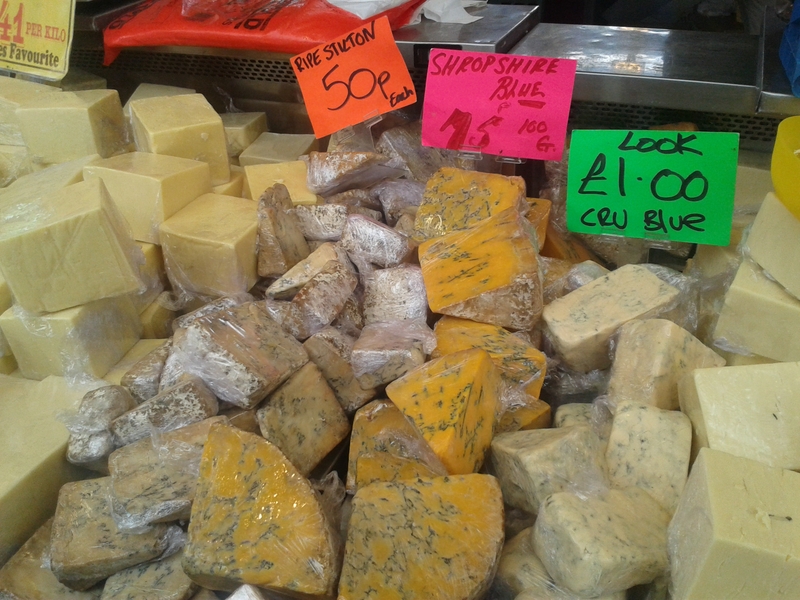 Speaking of surplus amounts, every stall holder I did business with was lovely - they don't run out of smiles, and all seemed cheery, even on a cool morning. Perhaps it was my keenness, but I've got a feeling the traders love what they do; being surrounded by all of those antioxidants and live enzymes does something to you, or just maybe it's the walks of life they encounter on a daily basis. Variety is the spice of life after all. 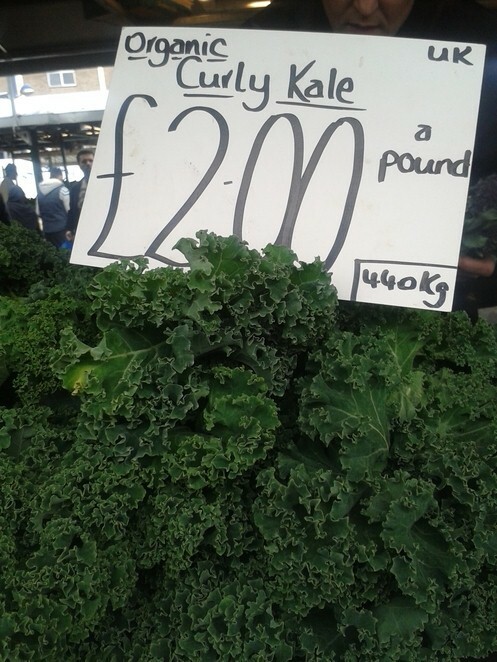 I've been to Spitafields Market and this sounds a lot better; their fruit & veg deals are amazing value.